Kakashi Hatake is a fictional character in the Naruto universe created by Masashi Kishimoto and developed into a media franchise, consisting of a series of manga, anime, soundtracks, OVAs, movies, video games, and other collectibles. Kishimoto originally planned to introduce Kakashi in the manga to the series' titular character, Naruto Uzumaki, early on, but pushed back this meeting so that Naruto's teammates could be better developed. In the anime and manga, Kakashi is the leader and teacher of Team 7, consisting of the series' primary characters, Naruto Uzumaki, Sasuke Uchiha, and Sakura Haruno. He is initially portrayed as a detached and apathetic figure, but as the series progresses, his loyalty to his friends and students becomes increasingly apparent. Kakashi's past has been extensively explored in the series, resulting in a gaiden being devoted to his past experiences. Kakashi has appeared in several pieces of Naruto media, including the two of the four featured films in the series, all of the original video animations, and several video games. Numerous anime and manga publications have praised and criticized Kakashi's character. Although he has been noted to be an echo of similar detached shōnen characters, the duality of Kakashi's apathetic and serious sides have been praised. 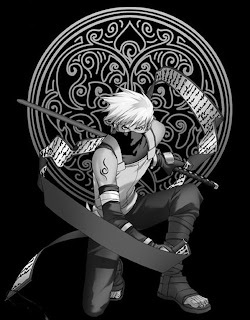 Kakashi's popularity has been noted by reviewers; T.H.E.M. Anime Reviews commented that the series could simply be renamed "Kakashi." Kakashi has been highly popular with the Naruto reader base, placing high in several popularity polls. Merchandise based on Kakashi has also been released, including key chains and plush dolls. Kakashi's background goes unexplored for the first part of the series, not being shown in any detail until Kakashi Gaiden, a six chapter series that divides the gap between Part I and II of the manga. During Kakashi's youth his father, a ninja that was highly revered in Konohagakure, abandoned a mission crucial to the village in order to save the lives of his teammates. Disgraced by the villagers and those he had saved because of the repercussions the village suffered, Kakashi's father committed suicide. Wishing to avoid his father's dishonor, Kakashi adopted the philosophy that the success of a mission must always come first, becoming humorless and by-the-book in the process. In later years Kakashi was assigned to lead a mission that would turn the war going on at the time in Konoha's favor. When his teammate, Rin, was captured by enemy ninja, Kakashi elected to leave her behind and finish the mission. His other teammate, Obito Uchiha, rejected this alternative, stating that those who abandon their friends are worse than garbage and that Kakashi's father had done the right thing by saving his teammates. Touched by Obito's words, Kakashi joined him in a rescue effort, though his left eye became damaged in the ensuing battle. After finding Rin and preparing to escape, an enemy induced cave-in crushed Obito. With the cave continuing to collapse around them and Obito unable to free himself, Obito urged his teammates to save themselves. Before leaving, Obito had Rin implant his Sharingan eye into Kakashi's damaged eye socket as a gift. His new eye in place, Kakashi fled with Rin as the cave collapsed, eventually completing their mission and forever mourning Obito's death. Obito's death greatly changed Kakashi, as he adopted many of Obito's traits and philosophies. Most recurring of these is his concept of teamwork: when first forming Team 7, Kakashi tests their abilities with a bell test wherein the three must capture the two bells he keeps on his person. Only by working as a team, regardless of the fact that there aren't enough bells for each of them, are they able to pass, instilling in them the concept of teamwork early on. Kakashi continues to further this philosophy for the duration of Part I upon Sasuke Uchiha, whose drive to get stronger causes him to slowly turn against his friends and teammates. Though Kakashi frequently reminds Sasuke of the importance of teamwork and tries to show him how strength can be found in friendship, he is unable to get through to him before the latter's defection. Kakashi keeps his personal life separate from his interactions with his students, only going so far as to say that he has a number of hobbies and dreams that are "none of [their] business". He also states that everyone precious to him is dead. What is known of Kakashi's personal life is that he spends much of his free time at a memorial site where Obito's name is engraved. He tends to lose track of time when he is there, and is frequently late to his appointments as a result (another trait adopted from Obito). Similarly, Kakashi constantly keeps the lower half of his face covered, and thus the appearance of his face remains a mystery. Episode 101 of the anime, an omake episode dedicated to Team 7's efforts to unmask Kakashi, implies he is quite handsome, as two employees at a ramen shop (male and female) are left awestruck after he briefly removes his mask to eat. One pastime that Kakashi allows his students to be aware of is his fondness for the Make Out (イチャイチャ, Icha Icha?) series of novels. The books, detailing the author's (Jiraiya) experiences in love, are runaway best-sellers within the Naruto world. When asked more specifically about the contents of the books, Masashi Kishimoto explained that Naruto's target demographic was not old enough for him to disclose the details of the plot. Kakashi is usually seen reading one of the books during events that do not require his complete attention, such as his early conversations and training sessions with Team 7. Naruto has on occasion used Kakashi's attachment to the books against him; he threatens to spoil the ending of the latest installment in the series, forcing Kakashi to shut his eyes and ears to avoid learning the secret and leaving him off guard in the process. The Sharingan given to him by Obito is a sticking point to Kakashi's fame in the Naruto world. Granting him the ability to mimic the movements and jutsu of others, the Sharingan gives Kakashi an edge in battle by allowing him to turn his opponent's abilities against them. Because it is a transplanted eye Kakashi's Sharingan is always active. Similarly, because the Sharingan is unique to those of Uchiha lineage, Kakashi's Sharingan is very taxing for him to use. Because of its shortcomings, Kakashi keeps the eye covered with his forehead protector when he is not using it. Despite this, Kakashi is very proficient with his Sharingan, being of comparable mastery to experienced Uchiha like Itachi Uchiha. During the gap in time between Part I and II, Kakashi even develops a Mangekyo Sharingan. With it he can create a localized interdimensional space-time warp, allowing him to send any targeted object to another dimension. Because performing this ability requires extended bed rest afterwards, Kakashi avoids using it unless absolutely necessary. With his ability to mimic the jutsu of others, Kakashi has added over one thousand different attacks to his repertoire, leading to his nickname of "Copy Ninja Kakashi" (コピー忍者のカカシ, Kopī Ninja no Kakashi?). Much of this extended arsenal is composed of ninjutsu, making him a specialist in the field. Kakashi is well-rounded in all other jutsu-types, shown to be adept with taijutsu and at least having a cursory knowledge of genjutsu. Because of his abilities, Kakashi is noted to be an obvious candidate for the position of Hokage, the protector of Konoha, should the position ever become vacant. Although most of Kakashi's abilities were acquired with his Sharingan, Kakashi has two abilities he developed by himself. Lightning Blade, a collection of lightning chakra in one's hand, was created by Kakashi in his youth. By rushing at the enemy and thrusting the Chidori into a target, Kakashi can kill most opponents with one strike. Because of the speed at which the technique is performed, regular eyes experience a tunnel vision effect when using it and leaving the user open to counterattack. After gaining his Sharingan, Kakashi was able to overcome this flaw, and uses its analytical capabilities to better react to enemy movements. His second unique ability is the pack of ninja dogs he is able to summon to his side. The dogs, presumably raised by Kakashi since they were puppies, are called upon when Kakashi needs to find something or someone and can then hold that target in place while Kakashi catches up to them.